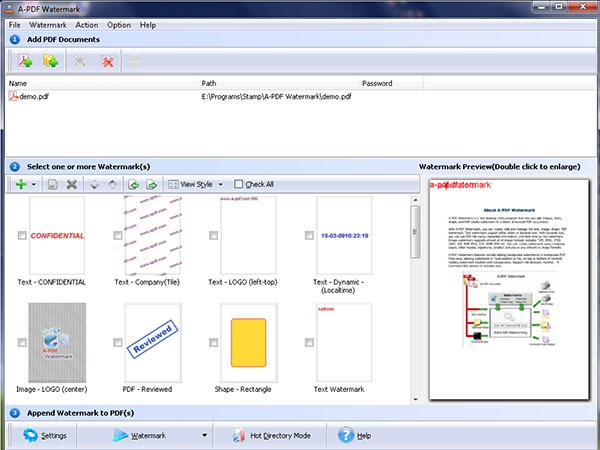 PDF Stamp (A-PDF Watermark) is an outstanding tool which allows governmental organizations, corporations and law firms to add page numbers, copyright notices, disclaimer statements, file names/numbers, Bates numbering, and more to existing PDF files. If your organization requires dynamic stamping or batch stamping of PDF files, check out PDF Stamp. PDF Stamp enables you to add stamps to every page in a document, or to specific page ranges or increments. Moreover, you can stamp copyright notices, disclaimers, or any other text in your choice of font, point size, opacity level, and color (RGB or Grayscale). Create as many lines as you need in your text stamps with complete control over line breaks. Use variables to stamp file and path name, document information, page numbers, Bates numbering, and the date and time in a variety of formats. Remove the last stamp you placed via the PDF Stamp menu.